"Empire (magazine)" redirects here. For the defunct magazine, see Empire (South African magazine). 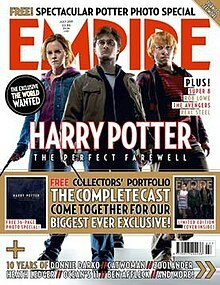 Empire is a British film magazine published monthly by Bauer Consumer Media of Hamburg based Bauer Media Group. From the first issue in July 1989, the magazine was edited by Barry McIlheney and published by Emap. Bauer purchased Emap Consumer Media in early 2008. Published in the United Kingdom, Empire organises the annual Empire Awards which were sponsored by Sony Ericsson, and from 2009 sponsored by Jameson. The awards are voted for by readers of the magazine. Empire reviews both mainstream films and art films, but feature articles concentrate on the former. As well as film news, previews, and reviews, Empire has some other regular features. Each issue (with the exception of issues 108–113) features a Classic Scene, a transcript from a notable film scene. The first such classic scene to be featured was the "I could have been a contender" scene from On the Waterfront. The regular Top 10 feature lists Empire's choice of the top ten examples of something film-related. For example, 10 Best Chase Scenes or 10 Best Movie Gags in The Simpsons. The Re.View section covers Blu-ray and DVD news and releases. Kim Newman's Movie Dungeon is a regular feature in the Re.View section, in which critic Kim Newman reviews the most obscure releases, mostly low budget horror movies. How Much Is A Pint Of Milk? presents celebrities' answers to silly or unusual questions, including the question "How much is a pint of milk?" This is intended as a guide to the chosen celebrity's contact with reality, and as such can be more informative than a direct interview by reporting some surprising responses. Each magazine includes a "Spine Quote", in which a relatively challenging quote is printed on the spine of the magazine. There are usually some obvious and obscure links from the quote to the main features of that month's edition. Readers are invited to identify the film source and the links to win a prize. My Movie Mastermind is another regular in which a celebrity is given questions about the films they were in or they directed. Celebrities range from Quentin Tarantino and Christopher Lee (who are at the top of the scoreboard) to John Carpenter and Michael Keaton (who are at the bottom of the scoreboard). A regular feature since issue 167, the Empire Masterpiece is a two-page essay on a film selected by Empire in the Re.View section. The selection of the films seem to be quite random and follow no specific pattern. Only a few issues since the first masterpiece feature have not featured one – 169, 179, 196, 197, 198 and 246. Issue 240 had director Frank Darabont select 223 masterpieces. L.A. Confidential was featured twice, once in issue 191 and again in issue 303. Risky Business – Ready Ralph? They also selected the 50 greatest films rated with an 18 certificate. Empire occasionally poll readers to find out what their favourite films are. In 2017, Empire surveyed five thousand readers to produce a list of the 100 greatest films ever made. The list was selected in September 2008 by over 10,000 Empire readers, 150 film makers and 50 film critics. The list was accompanied by many different covers, each of which went on sale. The top 30 chosen films are listed below. The list's most represented director was Steven Spielberg, who had eleven films in the top 500. The top sixteen directors are listed below. Their highest-ranked film is also provided, as well as its position. The entire list can be found at Empire. In June 2015, Empire's readers named the greatest film characters of all time. The top fifteen characters are listed below. Mark Dinning (210–304). Dinning was formerly Associate Editor on the magazine leaving to take up the position of Editor of Total Film for a period, he then returned to take up the same role for Empire. He left the magazine in July 2014. Steven Spielberg guest-edited the magazine's 20th Anniversary Issue in June 2009. Sam Mendes guest-edited the magazine's Spectre special in September 2015. ^ "ABC Certificates and Reports: Empire". Audit Bureau of Circulations (ABC). Retrieved 12 March 2017. ^ "Jameson Empire Awards 2009 website". Empireonline.com. Retrieved 16 October 2012. ^ Darabont, Frank (15 May 2009). "Frank Darabont's Greatest Movies Of All Time". Empire (240). ^ "The 100 Greatest Movies". Retrieved 20 March 2018. ^ "Empire's 500 Greatest Movies Of All Time". Empireonline.com. 12 May 2006. Retrieved 16 October 2012. ^ "Star Wars' triumph in best movie poll". London: BBC News. 23 September 2001. Archived from the original on 26 September 2015. Retrieved 26 September 2015. ^ "The Greatest Movie Characters Of All Time". Empire. 29 June 2015. Retrieved 20 August 2016. ^ Sciretta, Peter (1 December 2008). "Empire's The 100 Greatest Movie Characters of All Time". SlashFilm. Retrieved 20 August 2016. ^ Turvill, William (24 July 2014). "Empire editor-in-chief steps down to join Time Out Dubai after eight years". Press Gazette. Retrieved 12 August 2014. ^ Turvill, William (2 September 2015). "Time Out New York editor-in-chief Terri White to take charge of Empire". Press Gazette. Retrieved 12 April 2017. ^ Helen O'Hara (5 February 2009). "Steven Spielberg To Guest-Edit Empire!". Empire. Retrieved 16 October 2012. ^ "Empire's 20th Anniversary Edition". Empire Magazine. 6 May 2009. Retrieved 6 May 2009.